In this Lesson, we will explore how to write Excel 2010 VBA code that formats the color of an MS Excel spreadsheet. 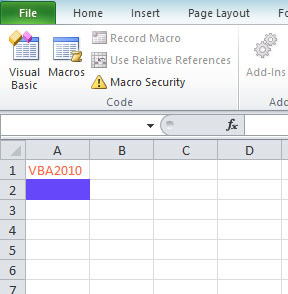 Using Excel 2010 VBA code, we can change the font color as well as the background color of each cell effortlessly. Alright, let’s create a program that can format random font and background colors using a randomizing process. 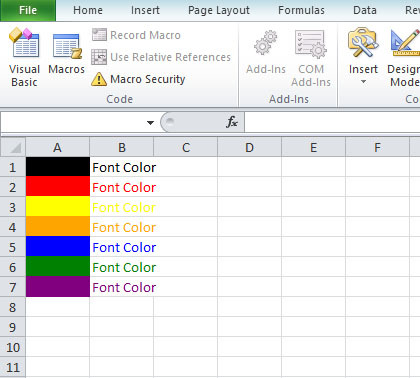 Colors can be assigned using a number of methods in Excel VBA 2010, but it is easier to use the RGB function. The RGB function has three numbers corresponding to the red, green and blue components. The range of values of the three numbers is from 0 to 255. A mixture of the three primary colors will produce different colors. In this example, clicking the command button changes the background colors from Cells(1,1) to Cells(7,1) according to the specified RGB color codes. It also formats the font colors from Cells(1,2) to cells(7,2) using specified RGB color codes. So we need to add 1 to get random integers from 0 to 255.